A £1bn deal to regenerate two shopping centres in Croydon has been approved by the council, with the promise of 5,000 jobs being created. Hammerson and the Australian giant Westfield are to come together to transform Croydon's Whitgift and Centrale shopping centres. The scheme now has to go to the London mayor's office for final approval. Croydon Central MP Gavin Barwell said he hoped the scheme would encourage more people to invest in the area. Detailed designs for the scheme will be unveiled next year and building work could begin in 2015. Part of the plans include a skills centre in the hope that many of the jobs would go to local people. 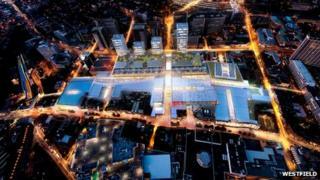 The scheme would see retail, leisure facilities and restaurants open and 600 new residential units built. The council has started to approach people who might be affected by the proposal. The project would see improvements made to existing public areas adjacent to the development such as North End, Poplar Walk, Wellesley Road and George Street together with new road junctions for traffic to Wellesley Road and Park Lane. This would mean people would be able to walk through the town centre at night rather than having to walk around the shopping centre. Speaking to BBC London 94.9, Conservative MP Mr Barwell said: "I think this is badly needed investment in this town. "I've grown up in Croydon - I've lived there all my life - but there's no doubt that Croydon town centre is in real need of investment and I think the planning application that went out last night is a once-in-a-generation opportunity to turn around the reputation of our town. "Not only do I think it will improve the retail centre, but it will encourage other people to invest in the town." Originally the two retail giants were competing against each other to redevelop the shopping centres, but came together after council and the mayor's involvement. John Burton, director of development of Westfield, said he believed the plan had the potential to be a "major catalyst for the wider physical and social regeneration" of the town.